comment this post if you really want me to add you, and maybe i will. DO NOT ADD ME IF YOU WANT MY ART...ITS AT MY ART COMMUNITY! YOU WON'T FIND IT HERE! 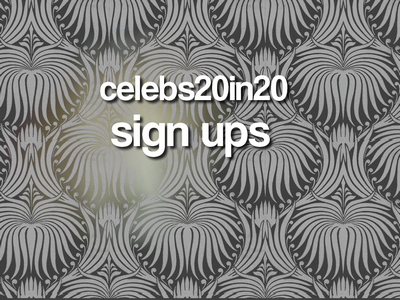 round 38 sign ups are now open for celebs20in20! what's a 20 in 20 community? well, you make 20 icons within 20 days according to 10 individual theme icons, 5 category icons, and 5 artist's choice icons! you have to claim a celeb that no one else has already claimed to make icons of! it's really fun and really makes you work harder on your icons! Hey everyone! Just thought I'd let you know that I am going on vacation for two weeks. I am going to Ireland from the 5th to the 19th, but basically the 20th. I probably won't be able to get online while I'm there. If I do it won't be for very long! Anyway, have fun while I'm gone! See you in two weeks! hey we have some ties to break for challenge #151 at stewart_stills! we could really use your votes! hey everyone, we have some ties to break for round #26 at celebs20in20! hey everyone! here is another batch of icons! i hope you like them :) this post remains public until July 27th. i'm going to be going out of town this weekend. i will be gone from Friday evening till Sunday (idk when) because it's my cousins wedding. so yeah, i'll be back some time on Sunday hopefully. if not Sunday, then Monday. does anyone know where i can find a compilation of all the season 3 Glee songs available for individual download? i want to be able to pic which songs i download. sign ups for round 24 at celebs20in20 are now open! we still have plenty of room and would love for more sign ups!